With exceptional water blocking features, this semi-dry includes skin-to-skin GLIDESKIN seals and a cross chest TIZIP MasterSeal water resistant zipper that virtually eliminate water entry keeping you warm and comfortable. I use the suit for 7 dives at this point. The water temperature was at the bottom 48-50F (9-10C), outside temperature was around 60F (16C) surface time was around 60 minutes. Deepest dive was 100 feet with 7 minutes at that depth (total time 34 minutes). Did a 3 dives/day with night dive (70 feet). Well the experience was significant. Now the review. After the first day (2 dives) I added a 3mm vest because at the zipper there is just a thinner single layer of neoprene (2mm). You can feel the cold immediately (30 feet). By adding the 3mm vest that suit start to shine. At no point above 80 feet was the cold a problem. Below 80 feet you can feel it, but that was tolerable (7 minutes at 100 feet). After completed 5 dives in two days the torso was completely dry, the legs (up to the knees) and the arms (to the elbows) were wet. The integrated hood is fantastic. 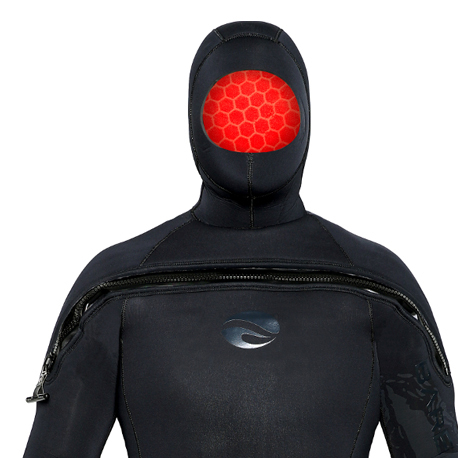 You will need more weight then a wetsuit but less then a drysuit since some air is trap (torso) unless you let the water getting in. I never unsuited between dives. 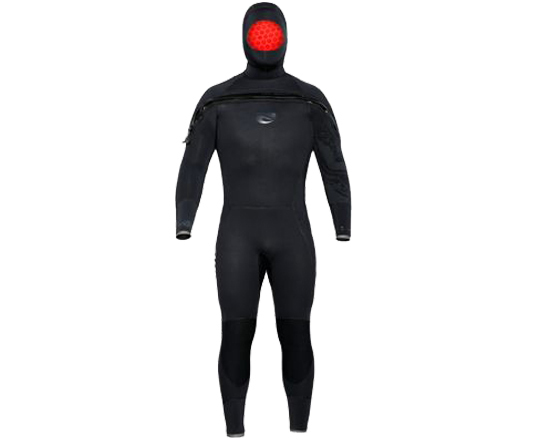 I will recommended this suit in late spring to early fall here in Vancouver BC. Longevity unknown.